Okay, it is safe to say I have been obsessed with the Pixies/Frank Black (AKA Black Francis) for about the last 2 years. If you aren't aware of how amazing they are you should do yourself a favour and check them out. My brother and I got to see the Pixies in Kitchener, ON this past April, on their Canadian Doolittle tour, and man it was the best concert I have ever been to. That's right I said it, the best. It could have been that night after the concert that my brother and I had a conversation about artwork and how he might like a print of something of mine for his apartment. It wasn't until about a month before his birthday that I got the idea to paint something just for him. 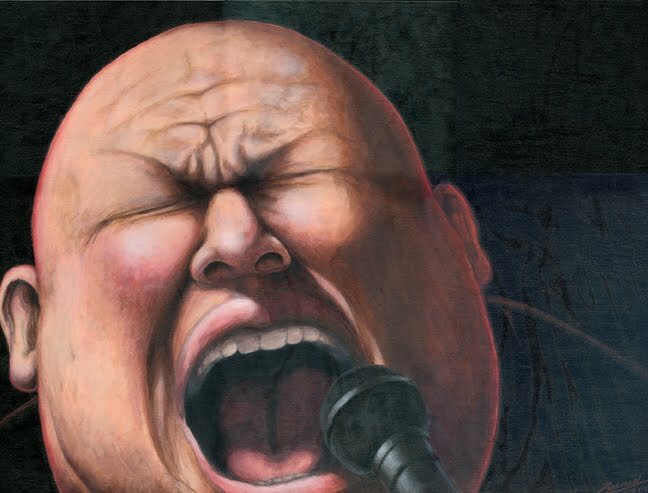 So after many late nights painting and stressing over whether he (and his girlfriend) would really want a picture of the Pixies frontman in the living room, I finished the above painting. It is 18" x 24" acrylic on canvas. I think he liked it and it did in fact find a home on his living room wall. Happy Birthday Dave. Oh, and there was a little inside joke on the painting to his wonderful girlfriend Kato, but you'll have to ask her about that. Dude- you are the best. I might not share in your love for the fat Frank Black, but I do love that your art is on our wall. Thanks again! Watch your step!